ISLA DE ASSUNÇÃO, Brazil , Mar 17 2018 (IPS) - Indigenous communities in Latin America, who have suffered the plunder of their natural resources since colonial times, are reliving that phenomenon again as mega infrastructure are jeopardising their habitat and their very survival. 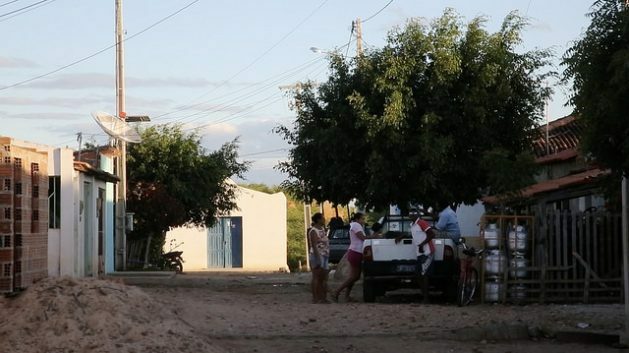 On the island of Assunção in Northeast Brazil, the village of the Truká indigenous people was split in two when the flow of the São Francisco River was diverted. “The Truká people have always been from this region. We are an ancient people in this territory. We have always lived on the riverbank fishing, hunting, planting crops. We did not need a canal,” lamented Claudia Truká, leader of the village in the municipality of Cabrobó, in the state of Pernambuco. The transfer, officially called the São Francisco River Integration Project, seeks to capture the river’s water through 713 km of canals, aqueducts, reservoirs, tunnels and pumping systems. According to the government, the largest national infrastructure work of this type will ensure the water security of 12 million people in 390 municipalities in the states of Pernambuco, Ceará, Paraíba and Rio Grande do Norte and will benefit rural and riverbank communities. But the project, according to what Truká told IPS, will hinder the process of demarcation of indigenous territories and will not bring them any benefits. “The transfer will have many negative effects. It affects the vegetation and our animals, and it draws water from the river, not to bring water to those who are thirsty but to favour agribusiness. There are other ways to solve the lack of water,” she said. 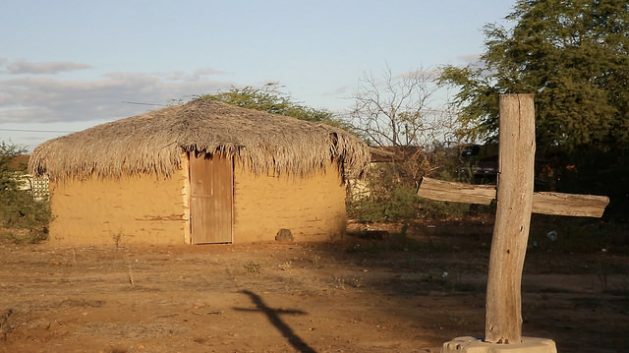 “We were already colonised by the Casa de la Torre (an estate transformed into a sort of barracks from which ranchers conducted raids of indigenous lands in the seventeenth century), which together with the Capuchin (Cacholic Franciscan order) favoured that process. Once again the Truká people are going through a process of colonisation,” she said. In the department of Madre de Dios, in the Amazon jungle in southeastern Peru, the Harakbut indigenous people are suffering the impacts of another megaproject. In 2006, the U.S.-based Hunt Oil company was granted a concession to a plot of land for the exploration and exploitation of natural gas, overlapping with the Amarakaeri Communal Reserve, in the ancestral territory of the Harakbut. In 2017, the company handed over that land because it had obtained no conclusive results within the deadlines for the exploration. However, there are five other producers interested in resuming the megaproject, Andrea Cardoso, a professor at the Arturo Jauretche National University, told IPS from Argentina. “The withdrawal of Hunt Oil from Harakbut territory does not mean that the problem has been solved, the impacts on the forest continue and have left their marks,” she said. “The company’s so-called public relations officers have convinced many indigenous people to work for them, or to accept goods or money. But other members of the communities continue to work on raising awareness about the oil industry’s irreversible impacts on the forests,” she said. In addition, the camps of company workers “generate diseases and the breakdown of the social fabric,” Cardoso said. The oil industry activity there is being carried out at the headwaters of several rivers, “which are the only sources of water for more than 10,000 people, including indigenous people and non-native colonists,” she added. According to Cardoso, the case of the Harakbut people must be analysed in a broader Latin American context. Since the end of the 20th century and the beginning of the 21st century, she said, “indigenous movements in Latin America have been at the centre of the political and social scene, in the framework of neoliberal practices implemented by different governments of the region,” with the influx of transnational capital for exploration and exploitation of fossil fuels. “It’s in this context that there has been a loss of control over the common goods of nature and of indigenous peoples’ territories, as a consequence of the territorial dispossession, in a cycle of transnational extractivism that threatens our Americas,” she concluded. Unda said from Quito that one of the most affected indigenous peoples in the initial exploration stage are the Shuar, on both the Ecuadorian and Peruvian sides. In a fragile ecosystem, a mining project of this scope “involves a profound transformation of their ways of life and their modes of survival,” he told IPS. They are guardians of the environment “with their struggle and resistance. Not only against the coalitions that represent the interests of the government and of the corporations, but also against sectors of their own peoples who support the mining projects,” said Unda. One emblematic case is in Andalgalá, in Argentina’s northwestern province of Catamarca, where the Minera Alumbrera mining company has operated the first open-pit mine in Argentina for more than 20 years, currently in the process of closure and clean-up, she told IPS. Guerreiro explained that “these ventures not only plunder the mineral resources and wealth of the territories they exploit, but also the water, a fundamental element in areas where it is scarce, leaving local people and their main traditional productive activities devastated and impoverished” and affecting their spirituality and their relationship with nature. Another case is that of the Diaguita community of Aguas Calientes, in the north of the same Argentine province, which is fighting to keep out mining companies such as Buena Vista Gold. “In these cases the only thing the communities can do is resist, protest and stop by their own means those who try to steal their land,” said the expert. “The defence of the territories carried out by the Diaguita communities becomes a socio-environmental defence, since their territories also include the Laguna Blanca Biosphere Reserve, a protected natural area of great planetary importance for its biodiversity,” she said. “However, the peasant and indigenous communities of the region – permanently subjected to persecution, dispossession and defamation – have historically resisted, and continue to resist, encroachment,” she said.